Open Debate The only forum to discuss politics and religion. Please keep it civil. This is not in support of either candidate. It's about the USA system of voting and if you think it should be changed. Let's first start with how the system works. When the citizen vote for president they aren't voting for president they are voting for electors. In fact Donald Trump hasn't won yet because the electors don't vote until December 19. The electors can be changed up until 6 days before the vote. So on November 8 we voted for electors in all but two states it's winner take all. So for example California has 55 electors which represent 55 districts in California. Because of the winner take all system Clinton won all of California's 55 elector votes. But Clinton didn't win all 55 districts. 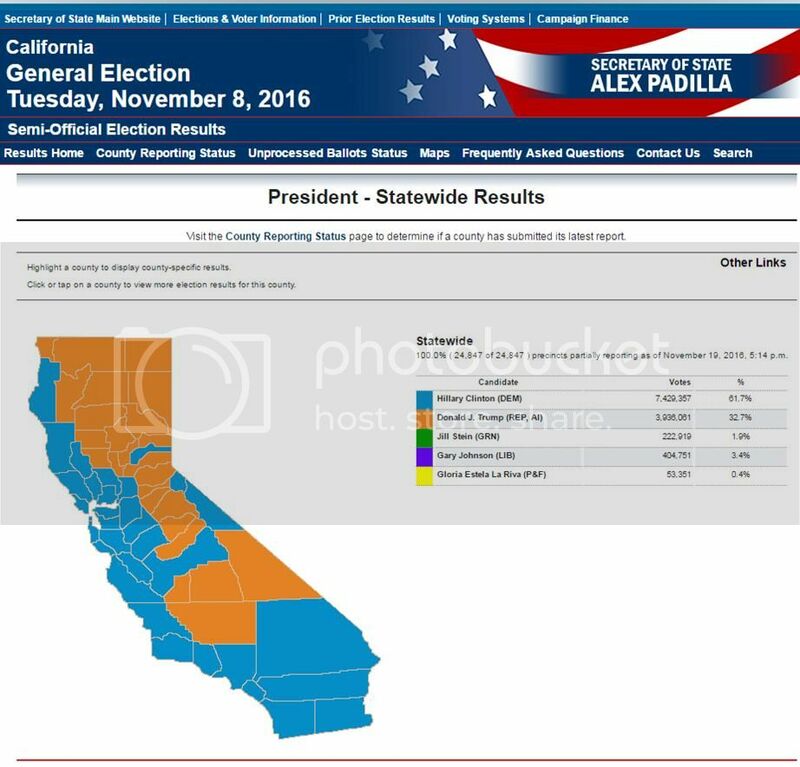 Below is a map of California votes the orange is Donald Trump. This is why the popular vote and the electoral vote doesn't always match. BTW the USA is not a democracy it's a Republic. So should the electoral college be abolished and it be purely popular vote? Two states Nebraska and Maine don't have a winner takes all rule. The elector votes go by who won the district; Maine and Nebraska reflect closer to the popular vote. Should all the other states (And DC) change to match Maine and Nebraska? I have attached links for more information on the electoral college. The electoral should be abolished. Should it be eliminated? NO. Is it likely to be? also NO. Eliminating the electoral college would require a constitutional amendment, which would first have to be passed by 2/3 of Congress --- not at all likely --- and then by 38 states. also very unlikely. Elimination of the electoral college would certainly make things much easier for candidates; they could ignore most states and concentrate their efforts on the half-dozen or so with very large populations. Personally, I don't want my presidents elected by New York, California, and Florida. Most especially by California. Sistersolo, I feel slighted that you don't like the people of Florida. And I'm surprised that you don't like the great state of California. Manuel, I was BORN in Florida, and went through elementary school in California. I still have a number of relatives in both places, and love to visit them. That has nothing at all to do with them having populations that dwarf half of the states in this great Union. Right now they can ignore California completely. Because of the ratio of people to electors. The states with the fewest people per electoral vote, and therefore the highest “vote power,” are Wyoming, Vermont, and North Dakota. In Wyoming, there are 143,000 people for each of its three electoral votes. The states with the weakest votes are New York, Florida, and California. These states each have around 500,000 people for each electoral vote. Also because most states are winner take all the minority vote in California is not heard. Trump had 33% of the vote but that 33% was not heard. So do you agree that instead of eliminating the electoral college that all states should operate as Maine and Nebraska doing away with winner take all and having each district's vote count. Also shouldn't it be required that the electors vote and they have agreed to. Right now the electors can decide to vote Clinton or even Johnson and even through Trump "won" these votes he would still not be president. There is a petition now asking the electors to do just that. It's a waste of time because not that many electors are willing to become faithless. We won't know for sure until December 19th. The Electoral College is and old antiquated system that should have been scrapped in the 19th. century. If the electors put Hillary in the White House - and they legally could - even the wingnuts would say get rid of it. The fact that the electors can disregard everything it what really brothers me. I almost want it to happen so it shows how flawed the system is. Katlady, the ratio of voters to electors may weaken the value of an individual vote, but that does not mean that candidates could ignore California. Particularly since it is a winner-take-all state, its total number of electors is among the largest in the country. Even if it should change to proportional delegation of electors, candidates could still gain more electoral votes there than in at least half of the other states. Besides, Silicon Valley and Hollywood provide tremendous opportunities for fund-raising. I will say again. The electoral college is a stupid and unfair way to elect our President. Let's find a way to get rid of this antiquated system. Neither California nor New York determine who wins with electoral votes. It comes down to a handful of podunk Yankee states like Wisconsin. Now that is stupid. The electoral college makes the votes in every state important! Why should the big city folk get to be the only ones who votes really count? The needs of Cities are far different then rural areas of this country. When the electoral college was thought up it was a stroke of genius and I am glad it was added to the Constitution. I do believe that all Electors should vote according to the wishes of each States population. Live life to the fullest because tomorrow may never come! We might as well skip the election and just have the electors go and vote for whomever they want. The big city folk are the ones that pay the most taxes, provide the most jobs, etc., etc. Their vote should count at least as much, if not more, than bumpkins. Why should those along for a mostly free ride determine what the majority endure. In these times, it is just another way to discriminate against poor minorities, the majority of which live in a dozen or so states, most of which are southern. Not the rust belt. If it's not one vote per person counted on an equal basis, there is no point in having an election. Katlady stated the obvious. "The U.S. is not a democracy we are a Republic." If you don't know the difference go back to Civics Class or Google It. If you don't like it then we will need to change our entire system. Are you prepared to vote on every bill that comes up? Who proposes those bills? Who decides if they come to a vote? We would do it all by voting. I guess you are all prepared to make voting your full time job. Donald Trump is the poster child for what the electoral collage is supposed to prevent. If they make him President-elect, it has failed in its mission. At the moment, trump is nothing and won't be President-elect unless and until the electoral collage votes for him. Currently, the closest thing to a President-elect is Hillary, who has a large lead in the popular vote. Zydeco, you are contradicting yourself. First you say that votes of the wealthy, who pay the most taxes, should count more than those of the poor. Then you complain that the very system which prevents that, discriminates against poor minorities. Even you can't have it both ways. We have a system of rules, one of which says that the electoral votes determine the President. Saying it should be the popular majority is like saying the team that has the ball the longest time should win the football game; but the rules say it's the team that scores the most points. Not at all. What I said was more populated areas pay more taxes. Rural poor minorities tend to live in the south. No, not all. The states that the college allegedly exists to protect are predominantly white. For worse or worse, yes, the current rigged system is the electoral college and we are stuck with it for this election. I'm quite certain that if the electoral college elects Hillary, the trumpers will defend it as vigorously as they are doing now. Hillary Clinton being elected president this election season is a pipe dream! Trump has far too many electoral votes for it to get over turned. 1 or 2 might turn against what the voters of their state wanted but not enough to cost Trump the election! Trump won, get used to it or it will be a long 4 years for you! Let the recount begin! One or two states turning to Hillary and a few electoral votes here and there and the winner of the popular vote could also win the electoral vote and there would be no more controversy. Get over it? Hell, there are still republicans out there who claim President Obama is a Muslim, wasn't born in this country, etc. trump may end up being President, but it will be by insulting and lying his way to the White House. He has no integrity or honor. If the electoral college results had given Clinton the Presidency and Trump had won the popular vote, the Republicans would try to change the system. You know it. The Putinites would be up in arms. Trust me you don't want to vote on all the crap the federal put out. Plus Federal bills are hard to read. They just show the new language and not the original code with amendments. Unless they changed it since I was reviewing bills. It has been a few years. I'm glad we are a Republic I don't want to change that. I also don't want to do away with the electoral college but it does need an update. It's not reflecting the popular vote because it's winner take all in 49 states and we can have faithless electors who don't vote according to the will of the people. One idiot voted for John Edwards instead of John Kerry. John Edwards was the VP. I wonder if John Kerry lost the election because he picked a running mate with the same first name that the electors were to lazy to be sure. Even idiot citizens have a right to vote. And plenty of them did for trump. That each state has 2 senators ensures all states have equal representation. Next we have to undo the gerrymandering that republicans have gotten away with for too long to manipulate the house. One good idea that trump had (not original, but still), is term limits for Congress. The GOP has already told him what he can do with that idea. If trump wants to impress the most people, get that through Congress. Very little will improve in this country, and much could get worse, if we don't reduce corruption with those who make the laws. The whole election process needs reform and protection. There was clearly interference from outside of the borders that no wall will have an impact on. It has been proven over and over that US computer systems are easily hacked. As for the electoral college, get rid of it. Those currently in power, and/or soon to be in power, would only waste time and money coming up with something that is worse. Forget about putting lipstick on that pig. Zydeco, I still don't follow your logic. If you think the more populous areas should have more "say" in an election than the rural ones, that's exactly what the electoral college does. California has more votes than Alabama, Louisiana, Mississippi, Arkansas, Tennessee, and Kentucky all put together. If you think the system protects the states that are predominantly white, well, I live in one of them. The entire northeast is predominantly white, and voted solidly for Hillary. The southern states, home to larger proportions of minorities, voted solidly for Trump. Katlady, getting rid of the electoral college would be somewhere between very difficult and impossible; but any state that want to do so can change from winner-gets-all to proportional distribution of electors, just by state vote. All it takes is someone to spearhead the campaign. People love to keep bringing up California and other states that didn't exist when the electoral college was invented. Women and others weren't eligible to vote. The electoral college was a compromise and wasn't perfect even way back when. It is that much more removed today. Rural America is predominantly white, especially in yankee states. The swing states are not located in the south. A proportional electoral vote might be easier to achieve, but also easier to reverse depending on which way the wind blows. A pendulum effect is not the most desirable. What most of America wants is, by definition, moderate. That isn't what America gets, especially with a corrupt congress and Washington. Having more electoral votes and having the voting power are not the same. Here is a map that shows the voting power of each state. The weakest states are Florida, California and New York. Having the most electoral votes does not mean you have the most voting power. That's why you see candidates campaigning in only certain states. Presidential election: A map showing the vote power of all 50 states.